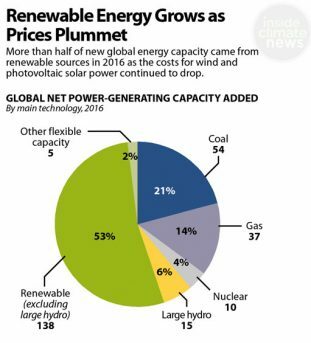 Thanks to continuing declines in solar and wind costs, the world added record amounts of renewable energy last year at the lowest prices ever, according to the United Nations. 55% of all new power came from renewables – one of the reasons emissions were flat in 2016 for the third year in a row. Investment in renewables was roughly double that of fossil fuels for the fifth consecutive year. In 2017, about 85 gigawatts (GW) of solar will be added around the world, more than double that of 2014, and China is expected to add 30 GW of that. The US, China, Japan and India will dominate the market in 2017, with India overtaking Japan as the third-largest market, according to GTM Research. For the first time, offshore wind will be built without any subsidies, as DONG Energy won an auction to build two offshore wind farms in Germany’s North Sea at super-low prices. The price to construct offshore wind farms is down 46% in the last five years – 22% in 2016 alone- reports Bloomberg. China’s emissions WENT DOWN for the first time last year, dropping 1% even as the economy grew 6.7%, says the International Energy Agency. The US had the biggest drop in emissions at 3%. Thanks to energy efficiency and renewables, US carbon emissions are 14% lower than 2005 levels – we are back to 1992 levels. “Wind and solar are increasingly the lowest-cost resources getting connected to the grid, changing the investment calculus for utilities and dominating new capacity builds. 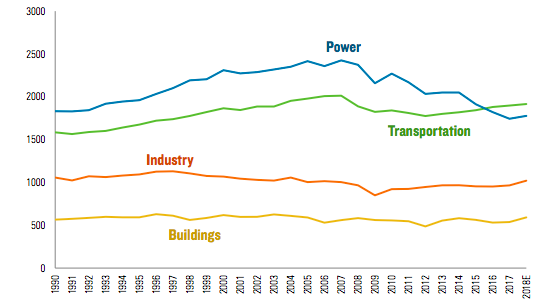 Electricity demand nationwide continues to fall, even as millions more square feet of buildings are constructed. And in states across the country, distributed solar is decimating load growth,” says GTM Research. 56 GW of coal plants could close in the Midwest because the average cost of wind is $10/ megawatt-hour cheaper, according to Moody’s Investor Services. San Diego slid past Los Angeles in 2016 as the most active solar market. Installations rose 60% to 303 megawatts (MW) – enough to power 76,000 homes. LA is in second place, followed by Honolulu and San Jose. The top 20 cities have nearly 2 GW of solar PV installed – about as much as the entire US at the end of 2010, says Shining Cities 2017: How Smart Local Policies are Expanding Solar Power in America. California got 13% of its electricity from solar in 2016, according to the US Energy Information Agency. Read our article, US Solar Grows 95% in 2016, In Best Year Ever. Chicago‘s mayor announced that all government buildings will run on 100% renewable energy by 2025, the most aggressive goal of any US city to date. For perspective, those buildings consume as much energy as 295,000 households. Two of the dirtiest coal plants in the country are also closing. Florida is finally about to be a solar leader! Utility Florida Power & Light plans to install an incredible 2.7 GW of solar across the state in the next seven years – enough to power 420,000 homes. After it closes a second coal-fired power plant, solar will be the primary electricity source after natural gas. New York State committed to 2.6 GW of offshore wind – the first major installation in the US. By 2030, wind will supply energy for 1.25 million homes. Facebook announced it’s building another 100% wind-powered data center, this time in Nebraska on 144 acres – at least two 450,000 square-foot buildings. The world’s largest beer-maker, Anheuser-Busch, announced it will run completely on renewables by 2025. It joins 90 other companies and 25 U.S. cities – large and small – that have made this commitment. Cities range from Madison, Wisconsin to Abita Springs, Louisiana. Pueblo, Colorado is doing it to bring electric rates DOWN and get more reliable energy and Georgetown, Texas says wind and solar power are more predictable and lack the volatile prices of oil and gas – a contract signed today sets prices for the next 25 years. Tesla’s Nevada Gigafactory started manufacturing in January, bringing back battery production to the US, in addition to making the Model 3 electric car. By 2018, the Gigafactory, which is a third complete, will double the world’s production capacity for lithium-ion batteries and employ 6,500 people. Besides building batteries for its vehicles – which could soon include trucks – Tesla is making batteries for homes and as back ups to the electric grid. 95% of components will be made in the US, including the enormous 70 MW solar array on the roof! Awesome news! It is really great to know that the investment in fossil fuels is demolishing comparing to the investments in renewable resources.